Hors d’Oeuvres started at 2pm. Cheesecake was served at 7pm. It’s pretty much what yer supposed to do when you get together with good friends. And we all believe in following the rules when it suits our purpose. This has been a tradition since we moved back here 10 years ago. Victor has known Linda since childhood. She was our real estate agent when we bought our house. David was our mortgage broker. Good friends with a lot of history. Friends you can say anything to without having to filter. And friends who like to eat! 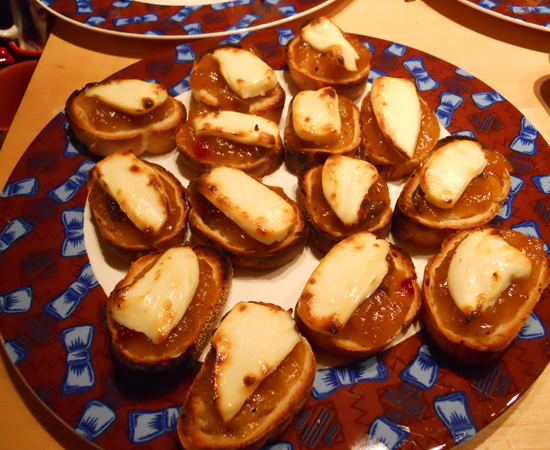 We started off with hors d’oeuvres. Just three, because we didn’t want to spoil our dinner. 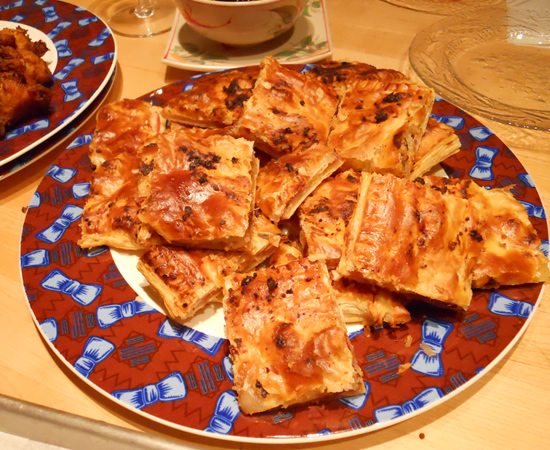 First off was a puff pastry dish Victor came up with based on something Ina Garten makes. She does a puff pastry, ham and cheese. Victor took it to a whole new level. Roll puff pastry to fit sheet pan – 10″ x 16″ or so. 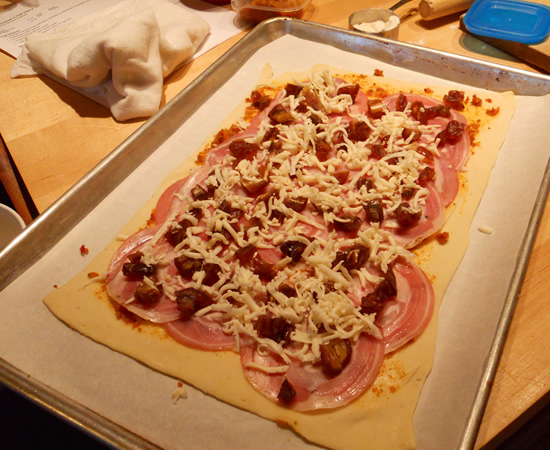 Brush with sun-dried tomato pesto, them layer pancetta, cheese, and dates. Roll second sheet of puff pastry and place on top. Crimp edges and brush with egg. Cut slits to allow steam to escape. Bake in a preheated 450° oven about 10 minutes or until golden brown. These were definitely a hit. They were easy to prepare and the fillings can be switched out a million and one ways! I decided we needed to do at least one deep-fried hors d’oeuvre because… well… we do have that deep fryer! I went with a crab fritter because I just couldn’t think of anything else savory that I wanted to do. 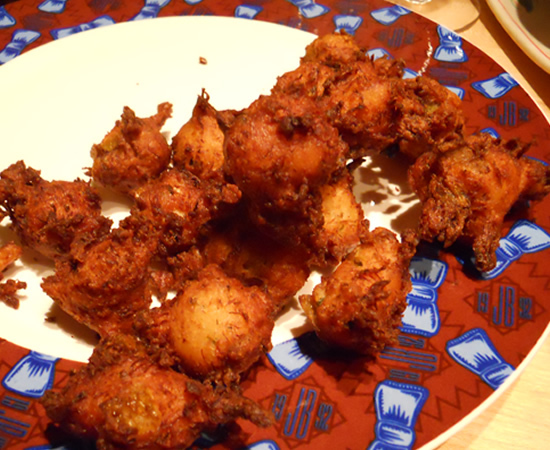 This was a totally wing-it recipe from the fritter to the dipping sauce, but it turned out great. The test fritters I made were still a bit doughy in the center so I really was caredul about the size. 1 tablespoon cooked up perfectly! Mix crab with chiles, buttermilk, chives, and egg. Add a bit of salt and pepper, to taste. Add enough flour to make a moderately-stiff dough. Drop tablespoon-sized balls into hot oil and cook until well browned. For a dipping sauce I decided to go sweet and spicy. We had homemade cranberry sauce in the fridge, apricot cookie filling in the fridge, and chipotles in adobo in the fridge. 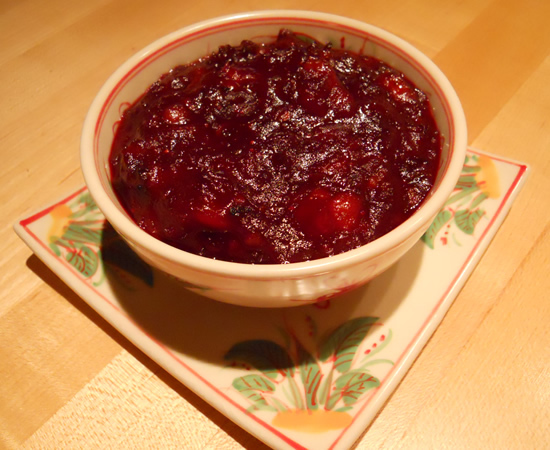 I made a cranberry apricot chipotle dipping sauce! Place ingredients in small saucepan. Heat. Mix briefly with immersion blender to blend and to break down larger berries or apricot pieces. And finally, we had bruschetta. I love bruschetta in any and all its various incarnations. Anything on toasted baguette with cheese is my idea of good. This was mere open-a-jar. We had a jar of Harry and Davids Charred Pineapple with Candied Peppers on the shelf for quite a while. Today it was spooned onto baguette slices, topped with cream cheese, and placed under the broiler for a couple of minutes. This was so simple and a total hit. By 4:30pm, it was getting time to sit down to dinner. 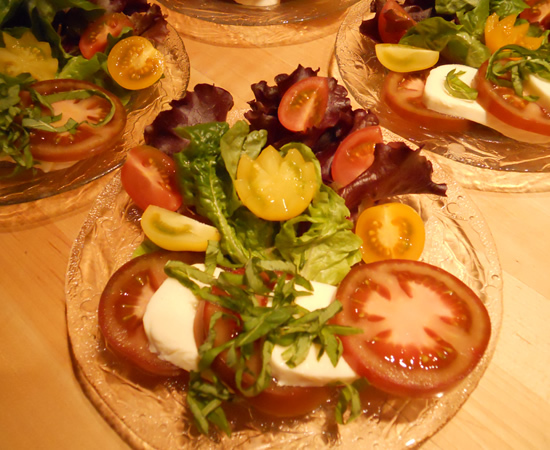 We started off with a simple Calabrese Salad. Red and Green leaf lettuce, tomatoes, mozzarella, and basil. I drizzled the whole thing with that nice, expensive olive oil Nick gave us for Christmas and some 15 year old balsamic. And a pinch of salt and pepper. It didn’t need anything else. Handmade pasta with a lobster sauce. Oh yes, you read that right. Handmade pasta with a lobster sauce. 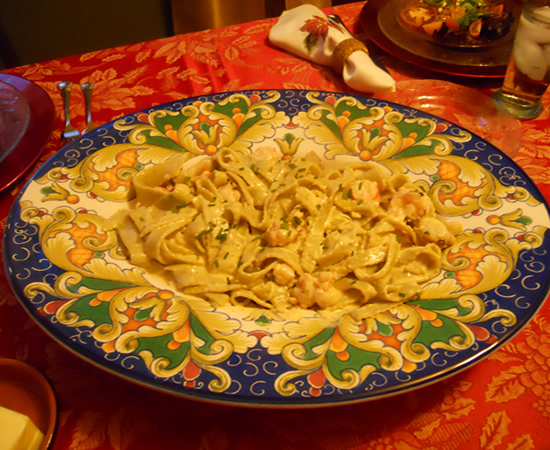 Victor made the pasta from a recipe he saw on Ciao Italia with MaryAnn Esposito. She serves the pasta with a clam and mussel sauce, but Victor had a better idea. Lobster. Place egg, 1/3 cup milk, olive oil and salt in bowl of food processor and whirl until smooth. Add flour and cheese and pulse until mixture is grainy looking. Add parsley and pulse just until dough begins to leave the sides of bowl. If dough is too dry, add a little of the remaining milk until you can pinch a piece of dough between your fingers and it does not crumble. Transfer dough to a floured surface and knead into a smooth ball. Place a bowl upside down over the dough and allow to rest for 30 minutes to relax the gluten and make it easier to roll. 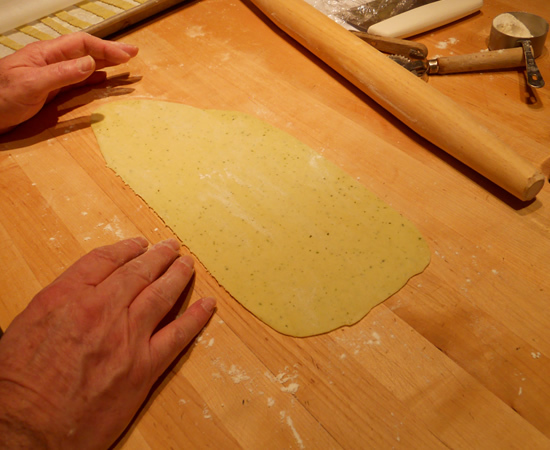 Divide the dough into quarters and keep three covered while working the first piece. Flatten the dough to a four inch wide piece. 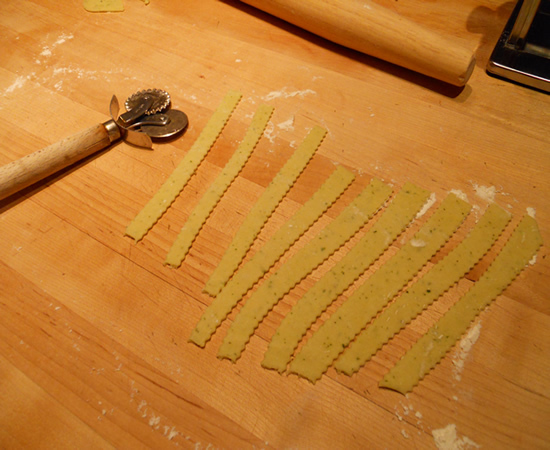 Place it through the rollers of a hand crank pasta machine set to the fattest setting (#1). Set the rollers to the next fattest setting down (#2) and run the dough through again. Use a small knife to cut 1/8 inch wide strips and place the strips on a clean towel. Repeat with the remaining dough. It made a wonderful and delicious pasta dish, but we think next time we make it, we’ll (that’s *we* as in *Victor*) roll it a bit thinner. It’s supposed to be a thick pasta, but our tastes tend to go for thinner. Place egg yolks in a large bowl. Grate the zest of 1 lemon into the bowl. 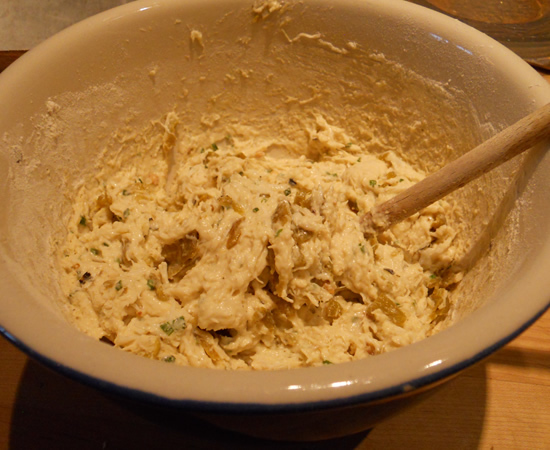 Add cheese and pepper, whisk to combine, then whisk in the cream, milk, parsley, chives and a generous pinch of salt. When the pasta is al dente, drain and return to the pot. Immediately add the egg mixture and lobster meat then toss together to combine. Serve immediately with more Grana Padano. It was gooder than good. It was great watching both Linda and David go back for more. It was everything it could be and more. And then, finally, it was time for dessert. 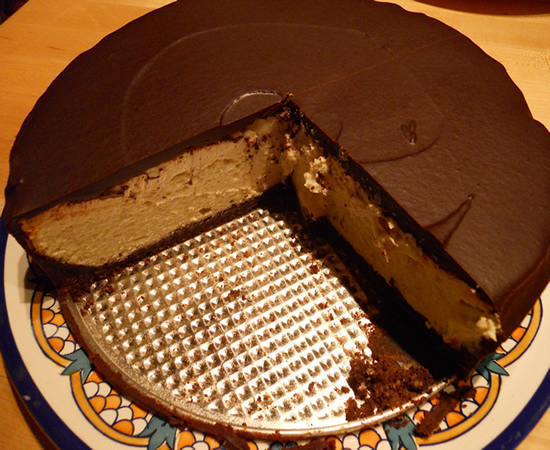 Linda is just a bit of a chocaholic, so we decided a cheesecake with a chocolate crust was in order. 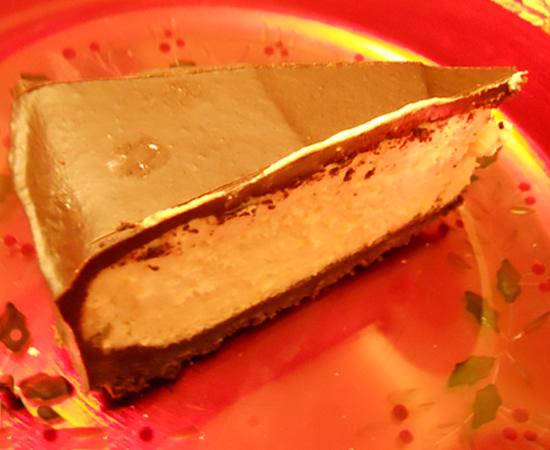 And this morning, I decided the cheesecake needed a chocolate ganache to cover it. The ganache was pure over-the-top decadence. I loved every calorie of it! On day you’re going to serve, make ganache. Heat cream. Remove from heat and stir in grated chocolate. Stir until smooth. Add vanilla. Remove cake from pan. Spread ganache over cake. Refrigerate until ready to serve. It really was a stellar day. And while we did eat a lot, at least it was spread out over 5 hours. 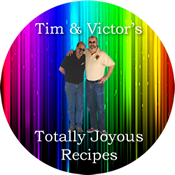 Our next feast with them is tentatively scheduled for July at their house to celebrate my and Linda’s birthdays. They feed us the same way.